Often times, when I am learning about far fetched technologies and how they will impact our future, it's hard to see how this impacts me TODAY. This was not the case last week when I saw the next wave of top fashion tech entrepreneurs present at XRC demo day. I was seriously impressed by each company and as an XRC alumna myself, I was uncategorically proud. Their ideas were not only genius but often times tangible, with applications that we can use today. Over the coming weeks I will be featuring some incredible ideas coming straight from these fashion tech badasses. I am talking today with Antina Lee of Perseus Mirrors on the topic of her intelligent mirror that take selfies, plays the news and youtube videos (hello makeup tutorials), shares the weather and tells me when my uber has arrived. Honestly, it feels like a product I should already own so I got right on board with this smart technology. Let's get right into this! Can you tell me about Perseus Mirrors? Sure! As you can probably guess, it’s a mirror, but much more than that! 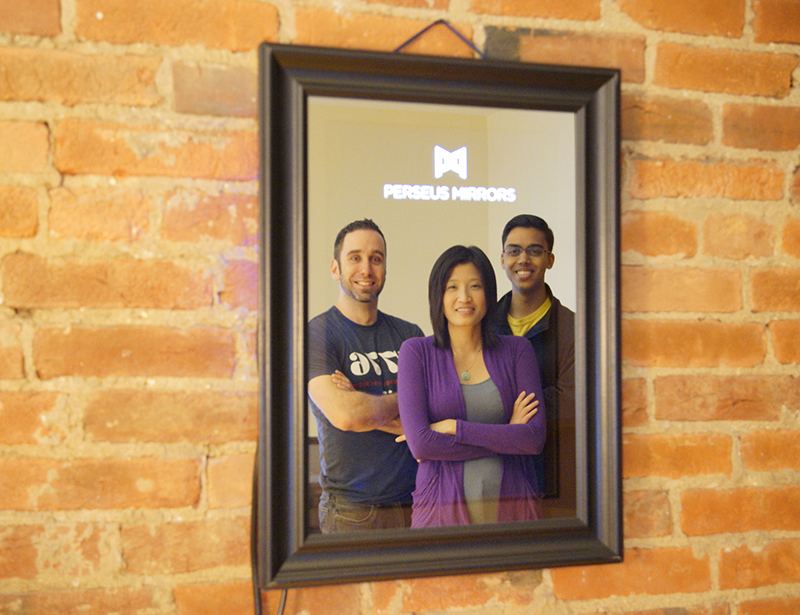 Perseus is the world’s smartest mirror, something right out of a sci-fi movie. It has an interactive digital display, voice recognition technology, and an intuitive user design. So what can Perseus do? Some feature highlights include showing you relevant news and updates on a customizable dashboard. You can easily see when the uber is arriving or how traffic is today to plan your commute. The mirror syncs with your email, phone messages, and notifications so your hands can focus on styling your hair versus holding a phone! You can also stream videos from popular video sites to watch anything from makeup tutorials to music videos to pump up your morning. Ah, and this one is probably my favorite - the mirror has an onboard HD camera that allows you to easily take high quality, shareable photos or selfies - no more holding up the phone - your hands are free to do poses! The possibilities are endless as we have an open development platform, meaning others can create applications for the mirror. Wow, this sounds pretty futuristic (and genius). How did your team come up with the idea? This actually stemmed from an interesting encounter. So Erik, Nikhil, and l (founding team) met last year at a Wharton MBA orientation event. Like all great orientations, this was held at the local bar. During the event, I went to the restroom and literally saw it packed with half a dozen girls with each of their phones out pointed at the mirror taking selfies. Nikhil pitched in and said, “There’s gotta be a better way to do that.” And so, over the next few beers and a few bar napkins, the Perseus Mirror was born. And over time, it has evolved to be much more than just a selfie mirror. Okay, I love this. It feels completely serendipitous that you three met that night to create this amazing product. You had to have had a certain skill set to achieve success though. Can you tell me about the background of you & your cofounders? We met during our time at the Wharton MBA program, but we all have different paths leading to where we are today. Erik is a serial entrepreneur who has built and sold a successful EdTech venture. He’s the guy you’ll never see wearing a suit - which makes him stand out a bit at our finance-heavy MBA program. Nikhil ran product and software teams at technology startups. He’s the super smart guy doing all the strategy and analytics. I come from a corporate background working in market strategy in consumer goods at P&G. I probably am the latest one of us three to get bitten by the startup bug, but it bit hard! Impressive backgrounds. Do you think an MBA is necessary to found a successful startup? Definitely not necessary, but sometimes helpful! What really matters is passion, energy, and persistence. Oh, I guess thick skin and shameless self promotion is a good asset too! We have our MBA education, but we’re making a ton of mistakes, falling and standing back up every day. You can’t learn everything about entrepreneurship in a classroom, you have to learn by doing. Hearing myself say this is really weird, maybe I should ask Wharton for my tuition refund. Haha. I will leave that to you. Let’s talk about the technology behind a smart -mirror. Can you break it down for me? Do you have a science background? How’s your electrical engineering? Here we go: First, you need an quantum holograph-enabled annealed glass, then you need a customized quad core microchip… No, I’m just kidding. The tech is not quite rocket science. Okay, you scared me there! We have spent months time finding the perfect materials and hardware for our mirror, but it’s basically a display with a specialized mirror in front of it. The genius really comes from the software and the interface design. How do you design a product that is so intuitive that even a 5 year old could use it? How do you build a product that not only works, but also delights the user? We devoted a significant amount of time behind user testing to get to answers for these questions. Now you make it sound easy! So what sort of expertise does it take to build smart object and how is that knowledge learnt? That’s a great question, and the answer is, it’s all problem solving. The beauty about our world is that knowledge is easily obtained and shared. Everything can be self-taught, if you have the time and heart to learn it! Of course, it helps to have someone show you the ropes - that speeds things up. For us, however, a lot of it was uncharted territory. We broke each problem into pieces, finding the experts or knowledge to figure out a solution for that piece, and then bringing the pieces together as a whole. It’s definitely not the most efficient and we are often running in circles, but at the heart of innovation is trial and error, and that’s the story of our life. I love that answer. You are a very inspiring woman, Antina! So, big question next: When will the Perseus Mirror hit the market and of course, how do I get one?! Perseus Mirror is available for a limited time now! We’re on Kickstarter until Aug 29 (11.59pm, not a minute later!). The product delivers Apr 2017. As an entrepreneur trying to bring her precious product to life, this is my favorite question! Grab yours while they’re hot here! What's next step for Perseus? Will you create more styles of mirrors or will the company expand into more consumer products? What's next? Our product is a mirror, but really we are all about making people feel empowered through technology. We’re definitely looking to expand the size selections: full length, larger, smaller mirrors, but we’re also looking at smart technologies and products that would make life more enjoyable. Awesome. Now, can you tell me about your experience with a fashion tech accelerator? Yes! The reason why we were interested in the XRC accelerator partnered with Parsons School of Design is because we have applications under development that we think fashionistas would benefit from. For example, we have a QR/Barcode scanner whereby you can scan beauty products in front of the mirror and it would bring up tutorials showing you ways to use the product. WHAT? I NEED THIS! Sorry keep going. Another one under development is the “Virtual Try On” feature, whereby you can see how jewelry or sunglasses look on you without actually putting them on. We have these ideas, but we really needed the right people to validate them and help us develop them. XRC was the perfect community for this. Not only did we find the right target demographic to speak with, we were introduced to retailers in this space would are interested in helping us build content for the mirror! SEE MY REVIEW OF NY FASHION TECH ACCELERATORS HERE. Any inspiring tidbits for the future #FemmBoss reading your interview? Now go out and shine. You are amazing. Thank you Antina.